The famous Greek brandy is named after the founder Spyros Metaxa (+1909). This acquired in 1880 with his two brothers in Piraeus in the region Attica extensive vineyards in the best locations. He experimented with the mixture of different wines and started with the distillation from 1888 so named product. During the construction of the first factory an antique coin with the symbol of the "Salamina warrior" was found. The name derives from the famous battle of the island of Salamis in 480 BC. The Greek fleet of Themistocles defeated the fleet of Persian King Xerxes I (519-465 BC). The find was seen as "a sign of divine intervention" and the coin became the trademark of the company on every occasion label emblazoned. Already in 1900 Metaxa was in the United States exported. Today the brandy is distributed in 110 countries. In 1960, Spyros and Elias Metaxa joined the company. In 1989, it sold the family to Distillers & Vintners (IDV). Finally acquired in 2000 Rémy Cointreau the majority of shares. Metaxa is still produced today with the same traditional method and care. The grapes used to produce Metaxa ripen on average over 2000 hours in the Mediterranean sun. The durchgegorene wine from three different grape varieties becomes with an already existing wine distillate to at least 18% to a maximum of 24% vol alcohol content strengthened. The resulting fortified wine is then burned to a high percent distillate at 52 to 86% vol. This is exclusively for further processing. The distillates are stored in French oak barrels from the Limousin area for years. The initially light color changes to golden yellow. Then the distillates are made by a secret herbal mixture (one of the known ingredients Rose petals ) and then finished the finished product by artful blending of different distillates. 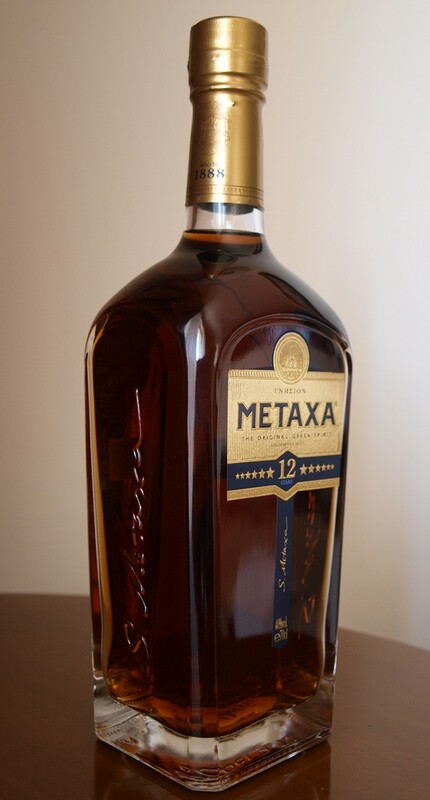 The alcohol content of the finished Metaxa is 38 to 40% vol. Depending on the brand. Compared to other brandies like Armagnac or cognac has a metaxa honey - sweetish and rosinated flavors on. During storage, as with any brandy, a small amount of it evaporates alcohol, Spyros Metaxa was reportedly convinced (at least as a marketing stumble) that this " angels share "Brought to Mount Olympus by good spirits and served there to the gods. The number of stars refers to the barrel storage time in years, there are 3 Star, 5 Star, 7 Star, and 12 Star Metaxas (shown in the picture above). Limited editions are released on various occasions, such as the 15-year-old "Grand Olympian Reserve" in a porcelain carafe or "Centenary", which is traded in numbered bottles and costs several hundred euros. These top products are distinguished by the ingredient of rare herbal and plant extracts. The oldest but rarely offered is the 30 years (formerly 40) stored "Private Reserve". The company will also become one ouzo (Anise brandy) produced. This page was last modified at 31 December 2018 at 10:48.